Amber fossils containing bugs are nothing new, but the discovery of a beautifully preserved Cretaceous Period beetle with bits of pollen still around it is changing what we know about the planet’s earliest pollinating insects. Earth’s oldest pollinating insects are a bit of a mystery, but fossilised insect dung containing bits of pollen suggest they first emerged during the Middle Triassic (247 million to 237 million years ago). More convincing evidence of insectoid pollinators dates back 165 million years, to the Middle Jurassic, in the form of fossilised scorpionflies, who likely used their long proboscis to pollinate non-flowering plants. Indeed, a fascinating aspect about early pollinating insects is that they were paired with non-flowering plants (gymnosperms), rather than flowering plants (angiosperms). Evidence for early pollination is sparse, which is why this new study is so exciting. The new research, published yesterday in Current Biology, is providing the earliest unambiguous fossil evidence of the relationship between gymnosperms and insects. Found in northern Myanmar’s Kachin State, this chunk of 99-million-year-old Cretaceous amber contains a beetle with bits of pollen around it. The pollen is from an unusual group of evergreen gymnosperms known as cycads, which, as this discovery suggests, could represent an early, or even the first, insect-pollinated group of plants. This Beetle belonged to the boganiid family, which are exceptionally rare in the fossil record, but are known pollinators of cycads. 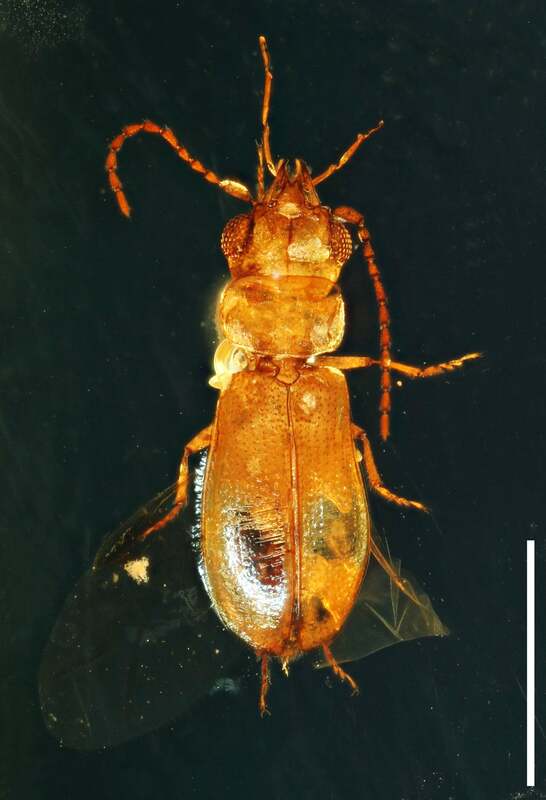 Chenyang Cai, a palaeontologist from the University of Bristol and the lead author of the new study, said it’s the only boganiid beetle out of over 22,000 amber pieces currently housed at the Nanjing Institute of Geology and Palaeontology (where the new fossil is also being kept). But pollen grains are also rare, as they are very tiny and can only be found using powerful microscopes after careful preparation. Importantly, this exquisitely preserved beetle (Cretoparacucujus cycadophilus) exhibits physical characteristics consistent with pollination, namely mandibular cavities, which it likely used to transport cycad pollen. This discovery also carries evolutionary implications. This boganiid beetle is known to have close relatives that date back to the previous Jurassic Period, with specimens found as far away as South Africa and Australia. 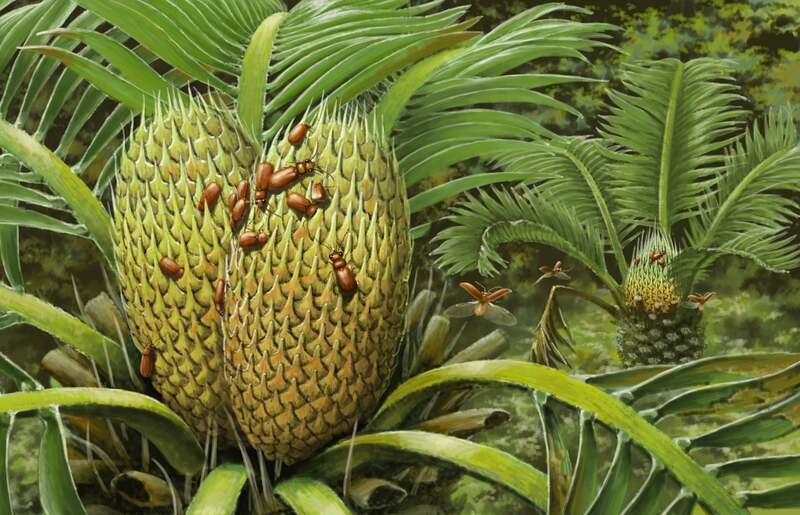 Cai says it’s very probable that beetle pollination of cycads evolved before the eventual breakup of the Gondwana supercontinent during the Early Jurassic, some 167 million years ago. “Our finding indicates a very ancient origin of beetle pollination of cycads at least in the Early Jurassic, long before the [emergence and spread] of flowering plants and their pollinators—such as bees and butterflies—later in the Cretaceous or later,” said Cai. Makes sense, but palaeontologists will have to find actual fossilised evidence to prove this conjecture. What’s more, scientists have not found larger fossils cycads, such as leaves, from Burmese amber—only the very tiny pollen grains reported in this new study.